Mozilla Thunderbird is a free email program that offers a range of options for PC users without access to robust paid software like Microsoft Outlook. Allowing you to integrate multiple mailboxes with SMTP or POP protocols, Thunderbird is a lightweight, responsive piece of software. Thunderbird is developed by Mozilla, the group behind Firefox. As of Thunderbird 15, Thunderbird supports instant messaging. To use Chat, you must first create a new account (or configure an existing account) with an online instant messaging or chat provider. 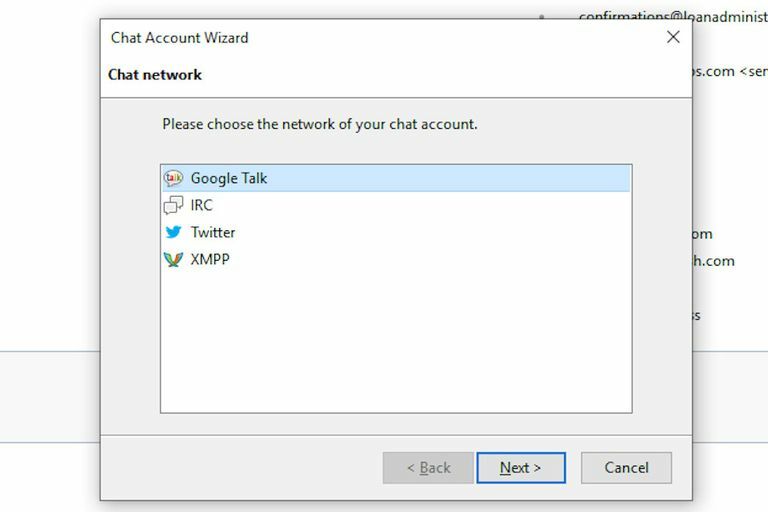 Thunderbird Chat currently works with IRC, XMPP, Twitter, and Google Talk. The setup process is very similar for each. At the top of the Thunderbird window, click on the File menu, then click ​New and then click Chat Account. Enter Username. For IRC, you will have to enter your IRC server name, e.g. irc.mozilla.org for Mozilla's IRC server. For XMPP, you will also have to enter your XMPP server name. Enter the password for the service. A password is optional for an IRC account and is only required if you have reserved your nickname on the IRC network. Advanced Options is not usually needed, so just click Continue. Finish the Wizard. You will be presented with a Summary screen. Click Finish to finish the wizard and start chatting. Click on the Tools menu and then click on Chat status and then Show Accounts. Click on the Connect button next to the account you want to go online with. Click on the Chat tab next to the Write tab to start and join conversations.